One of the 27 radio telescopes that comprise the Very Large Array (VLA) in New Mexico. Each telescope is 25 meters (about 82 feet) in diameter. Human vision is a glorious thing, but in many respects it’s limited. We can only see a very narrow range of the electromagnetic spectrum: the colors of light run from gamma rays to radio waves, with visible light falling somewhere in the middle. We use technology to compensate for our eyes, allowing us to “see” colors otherwise invisible to us. (No value judgement here! We humans evolved to see the light corresponding to the dominant wavelengths our Sun produces.) In astronomy, we use telescopes of a variety of shapes and sizes to turn light from distant objects into images and spectra—the constituent colors, whether we can see them or not. Radio light has the lowest energy and largest wavelengths: the waves can measured in centimeters or meters! The telescopes that see radio light are correspondingly larger than their visible light counterparts. The photo above shows one of the 27 telescopes of the Very Large Array (VLA) in New Mexico, each of which is 25 meters across. Each of the individual telescopes can see reasonably well, but when they all work together, they create some of the highest-resolution images of the Universe in radio light. For example, yesterday’s image of material surrounding the black hole at the center of our galaxy was comprised in part of radio data from the VLA. I visited the VLA in the fall of 2012 to gather material for my (now defunct) book, Back Roads, Dark Skies. 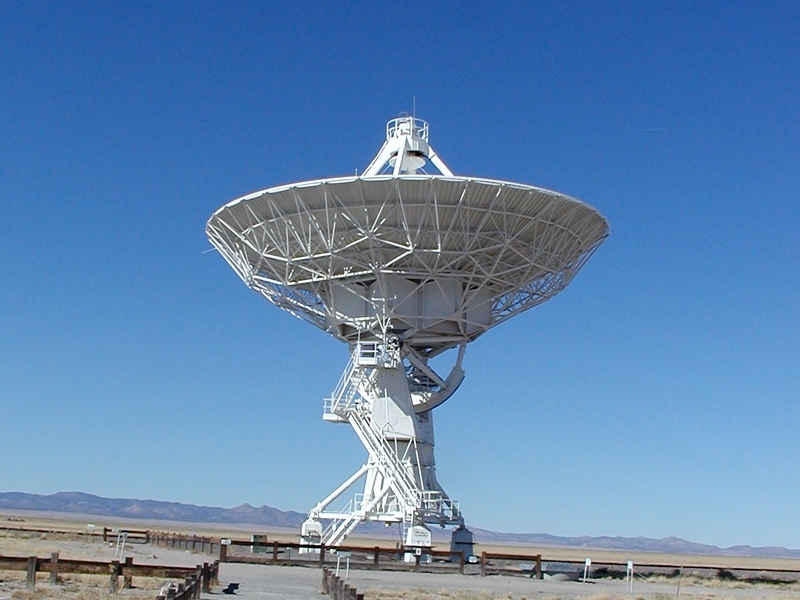 To anyone involved in astronomy or cosmology (or fans of the movie Contact), the VLA is a remarkably familiar object. I approached the array from the west, coming across the mountains from Arizona, and the first sight of the telescopes struck me profoundly. They were in their most far-flung distribution that day (most photo-op pictures involve moving the telescopes close together), so the dishes seemed to march away into the haze. I realized my reaction was very similar to how I felt upon seeing Stonehenge: the familiarity of the sight, far from disappointing, enhanced the emotion. The VLA is a scientific cultural artifact for our time, one to be cherished for what it means.